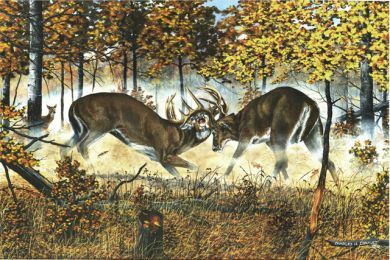 The echoes the clashing of antlers in this “Fatal Attraction” ring through the forest as two magnificent bucks vie for the title of dominant buck. A doe watches from afar awaiting the outcome of this furious battle, knowing perhaps that in the coming year her young will have the blood of the champion. All original painting prices listed are the “Appraised Value” of the individual painting. Prices sometimes reflect the commercial uses of the artwork such as Magazine Covers and or inside illustrations of the magazines. Please contact Chuck at 207-439-0342 for the actual price of the painting.